Today’s Shine The Spotlight is focusing on one of Sunshine Weddings Spain’s wonderful wedding beauty experts. Annika Friedriksson is originally from Sweden and having always had a passion for creativity and colour decided to pursue a career in hair and beauty. She originally trained in Stockholm, and in 2006 moved to sunnier climes to establish herself as a wedding make-up artist and hairdresser in Mallorca. She has since worked in fashion, TV and music shoots in London – now splitting her time between the three countries. Hi Annika. You seem to have had such a colourful career in beauty over the years. From fashion shoots to music videos, what keeps bringing you back to working on weddings in Mallorca? I just love weddings. Every year that I work with couples on their wedding day I realise how much of a passion it really is! I love the connection with the brides, from the first contact and then all the way leading up to their big day. Every bride is unique, and to be able to be there from the start to work with them and design their hair and makeup style for their wedding day is an absolute privilege. And then the wedding day of course – the excitement and happiness (and also a lot of nerves!) is something that I really love being around. There’s also a lot of pressure to get everything perfect on the day, so this job is definitely not for the faint of heart. How does hair and beauty differ from country to country? Do you have to take anything special into consideration when making up brides in sunny Mallorca? In general, bridal and wedding fashion can differ a bit from country to country, that’s definitely true. 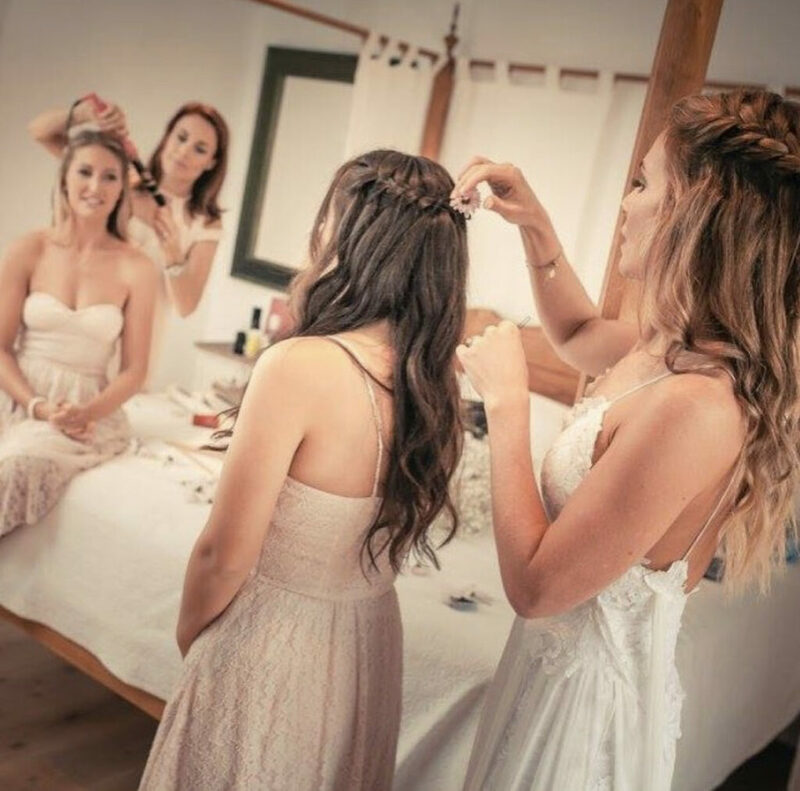 Although the most important thing to take into consideration, when it comes to bridal hair and makeup in Mallorca, is of course the heat and humidity during the hot summer months. It’s incredibly important to use makeup products that are waterproof so that the makeup will look flawless and last all day. And to also use hair products that work well under these conditions. You specialise in both hair and make-up. What made you want to focus on both instead of just the one? I went to art school when I was younger, and I was always into both painting and sculpture. I could never choose one or the other. It’s the same with hair and makeup. I love doing both just as much! I’m really glad that I do, as it’s very convenient for the bride to have the same person doing both the hair and makeup on their wedding day. It’s also great when I get booked for production work as they like to book someone that does both. You’ve been working with brides in Mallorca for over twelve years. How have wedding beauty trends differed over the years? There aren’t so many crispy, sprayed curls now as there used to be (thank goodness!). A lot of the brides want a more relaxed hair style and more ‘natural’ texture in the hair, without the appearance of a lot of hair spray. Also, we see quite a lot of flower crowns and hair pieces now, which I absolutely love doing. Having worked with some amazing brands and clients in your time – is there anyone left that you’d still love to work with? I really enjoy working with the large variety of people that I already get to work with, from different photo shoots to small, intimate weddings and onto the really big weddings as well. The variety makes it all so much fun, and I get to work with so many lovely people. I loved working with wedding dress experts Lovely Bride a couple of months ago, for example. More styled wedding shoots like that one is definitely on my wish list! And lastly, with your finger so firmly on the bridal beauty button, what would you say is the one beauty Must Do that every bride marrying in Mallorca needs to bear in mind? Get a good SPF and stay out of the sun during the days leading up to the wedding! Makeup doesn’t sit well or look good on sunburned skin, and it won’t look good in your wedding pictures. Thank you Annika for your fantastic insights into bridal beauty trends and weddings in Mallorca. Check out our other Shine The Spotlight features on our blog where you can meet more of our wonderful wedding photographers, entertainers, cake and beauty experts in mainland Spain and Mallorca!